Black Hawks are found in central Arizona, to the north of Phoenix, around Sedona, and so on. Several pairs are now starting to breed in South East Arizona as well. These Black Hawks have been present in SE Arizona for several years now. Over the past few years, regular summer records have been coming from Rose Canyon Lake on Mt Lemmon, California Gulch, Patagonia Lake, and Pena Blanca Lake. Other recent records outside the usual migration period are from Huachuca, Santa Rita and Chiricahua Mountains, and upper San Pedro river. It is always preferred to bird watch in locations where Black Hawks go to feed, rather than going to where they have their nest since they are very shy birds and easily disturbed. 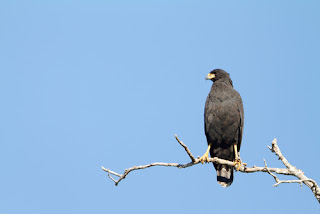 If you are an avid bird watcher then Arizona is the perfect place to see the Black Hawk. Stay with Casa de San Pedro.